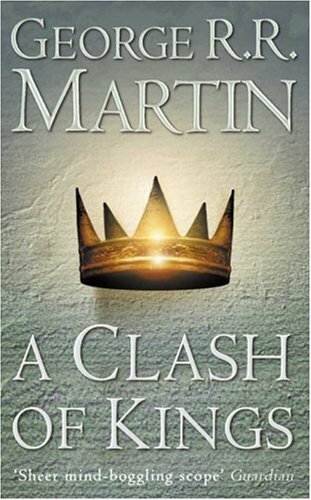 Last night I finished reading George R. R. Martin’s A Clash of Kings, the second book in the Song of Ice and Fire series. ¬†I gave Game of Thrones a 5-star rating. Five stars is a hard rating to come by and a hard rating to match and while I didn’t give A Clash of Kings 5-stars (I give it 4), it is only because some of the novelty of the style in which Martin tells his story is no longer new. Outside of that, A Clash of Kings was a rather breathtaking book that carries the story forward from where A Game of Thrones left off and mixes in some new viewpoint characters along the way. I counted 9 viewpoint characters throughout the novel (10 if you can’t the Maester in the prologue, who we never return to). Some of these characters we are familiar with and some of the them are new. Some of the new viewpoints are familiar characters, like Theon Grayjoy, but this is the first time we see things unfolding from his eyes. Others are new to the story, like Davos. He carries the epic forward in such a way that our interest is ever increasing, but without ever revealing too much at once. He build on the characters so that we become as familiar with them as our own friends and family. He build the world in such a way as that we become as familiar with it as our own surroundings. One of the things that impressed me about A Game of Thrones was that the “magic” in the story was only hinted at. People knew that magic used to exist, but much of it had disappeared. There wasn’t a good explanation for this, but that’s because no one really seemed to know why. It wasn’t until the very end of the novel that we started to see some hints of magic that still lingered in the world. In A Clash of Kings, we see more magic than we saw in the first book (indeed, we see some at work in the Prologue). Throughout the novel, we see more and more, just enough of it to keep us interested, but only marginally more overt than the first book. And yet, as the magic takes place, we also learn why it is growing stronger and that reasoning, so far as I can tell, falls completely in line with the story as laid out so far. But the book is about much more than magic. It’s about the struggle of¬†5 men to become king of the realm. What I found rather remarkable about the events in A Clash of Kings is that when you get to the end of the book and see everything that has happened, it all makes perfect sense, and it all flows from what happened at the beginning of A Game of Thrones. As someone was saying on a podcast I was on the other night, you want to scream at Eddard Stark when he agrees to leave Winterfell to become the Hand of the King: “No! Stay behind! Don’t go!” The world is a very different place than it was when things started out. Another remarkable aspect of A Clash of Kings–for me at least–is that the characters are by now so well developed that as a reader, I felt like I knew them and could guess their reactions to various events. When one of the key players in the struggle to become king was killed, my first thought was: oh man, what is Tyrion Lannister going to think about that? When Davos led the fleet into the river before King’s Landing, wondering if there was some sort of trap, I wanted to scream at him. As these events unfolded, I found myself wondering what the various players would think of them, in much the same way I do when some juicy piece of gossip reaches you at work. (“Wow, I wonder what so-and-so will say when they find out that project has been killed.”) It takes some measure of skill to build characters so rich and deep and distinct from one another. I wish I could do this as well in my own writing. In addition to the characters, the surrounding world has become more familiar in all of its aspects. Often times, in epic books like these (those that I have read), I easily get lost in trying to deal with all of the places and people and their spacial relations to one another. But Martin is so subtle about how he introduces places anad characters, so vivid in his description¬†horrendous¬†of them, that it all seems clear in my head and when we follow characters to places, be they sites of battle or big cities, I never feel lost. And there must be hundreds of minor characters, but the more prominent of them are as clear in my mind as the major players. Perhaps my favorite scene in this book was the battle scene on the river in front of King’s Landing, especially when Tyrion Lannister leads a troop into battle. That scene reminded me very much of the opening scene of Saving Private Ryan. It was remarkable and during the time that I read that scene, the entire world around me fell away and I was very much there in the middle of that attack. I will be very interested to see how HBO managed to pull off that scene in Season 2 of A Game of Thrones. I also loved that we got to go beyond the Wall in this book. I’d say that there might have been some slow parts early on (the book is 1,000 pages long), but “slow” is a relative term and the change in pacing that I experienced might have been due to the fact that I couldn’t read the book every day. I was just too busy. But a number of people have told me that the first two books are really just a build-up to the third book, A Storm of Swords, which I started reading last night. ¬†Already I can’t wait to get more into that one. In the end, A Clash of Kings carried the story forward in a masterful way and has convinced me that George R. R. Martin really does know how to tell a story the right way.